“It is really important to have ags in your portfolio. Most people have gold and most people have oil. The fact that they don’t have ags is actually quite a mystery.” Sal Gilbertie, President of Teucrium Funds. As Sal Gilbertie would have it, CORN is not only the king of agricultural commodities. It is also the ticker symbol for one of Teucrium Funds agricultural ETFs. In addition to CORN, Teucrium offers three other single-commodity ETFs: WEAT, SOYB, CANE, for wheat, soybean and sugar. Each of these ETFs invests in futures and is configured to “mitigate contango and backwardation” and to track the price of its underlying commodity. A fifth ETF, with ticker TAGS, tracks an equally-weighted basket of corn, wheat, soybean and sugar. the long-term: growth in demographic demand in emerging markets. 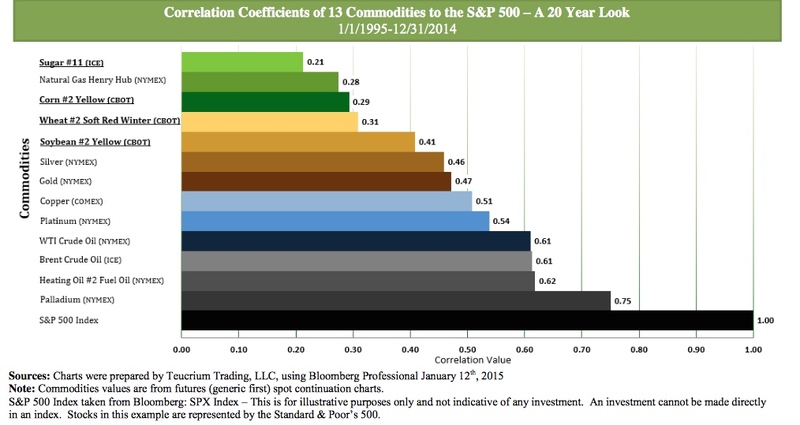 the timeless: diversification away from the S&P 500 and from gold. the short-term: agricultural commodities are now significantly undervalued relative to gold. Demand for agricultural commodities is expected to rise steadily in the decades ahead due to 1) the growth of the global population currently from 7 billion people to over 9 billion by 2050 and 2) the rise in living standards and concomitant improvement in diets in emerging markets. The table below shows future population estimates per the United Nations’ medium variant estimates. It should be noted that this medium variant assumes a big decline in total fertility rates (TFRs, number of children per woman) in India and Sub-Saharan Africa. In the event that TFRs do not decline as fast as expected, the population growth in these countries would be even greater. Asia and Sub-Saharan Africa will show the biggest jump in population and in demand for basic food stuffs. 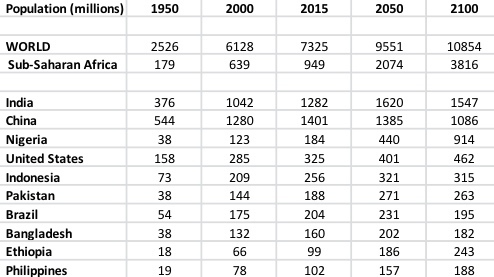 Note in the table that Sub-Saharan Africa is forecast to contribute half the population growth between today and 2050, and as much as 81% of the growth between today and 2100. It is not difficult to conclude from these figures therefore that Sub-Saharan Africa will require more than a doubling of food supplies in the next 35 years, a significant challenge at a time when it is still trying to eliminate hunger in many countries. Of course, supply is also growing but it is generally more volatile than demand due to periodic crop failures (from floods, droughts etc.) in one or another region of the world. Supply is also constrained by two factors: lower yields from farms in emerging markets and poor infrastructure in the regions of the world which have the largest unused acreages of arable land. More generally, looking at the global picture, Sub-Saharan Africa is believed to have the largest reserves of untapped arable land. As promising as this may be, massive investments in technology, infrastructure and logistics will be needed before new farm land can yield significant amounts of grain that can be delivered to consumers. For example, wheat yields in developing countries have nearly tripled from 1,000 kilograms per hectare in 1968 to over 2,600 now. To sum up, supply will keep up with demand but only if yields improve at existing farms and if new infrastructure is put in place to service new arable land. Agricultural commodities are less correlated to the stock market than gold and should therefore be considered for diversification at any time. In recent decades, gold has drawn tens of billions in portfolio investments mainly because it was seen as a hedge against possible dislocation in financial markets. Gold delivered on its promise as an effective diversification asset in 2008-2011, outperforming stock markets by a wide margin during the financial crisis and its aftermath. Although it has retreated from its 2011 highs in recent years, gold is still a significant outperformer of all leading stock indices in the decade and a half since it hit bottom in 1999. See chart above. 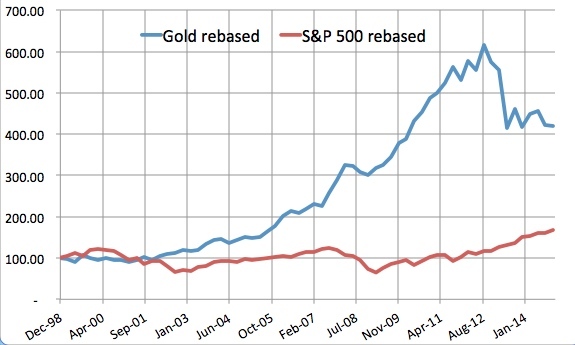 Of course, gold grossly underperformed stocks in the 1990s, but the subsequent decade proved that there can be prolonged periods of time when it beats the popular indices by a very significant margin, notwithstanding comments by some market participants who deride it as barbaric or uncivilized. The pragmatic reality is that, barbaric as it may be, gold sometimes outperforms stocks for ten or fifteen years. Still, if we have shown that diversification into commodities is desirable, the chart above from Teucrium’s web page argues that agricultural commodities are even better diversifiers than gold because they have a lower historical correlation with the S&P 500 than gold does. Through the 20-year period 1995-2014, sugar, corn, wheat and soybean have all had a lower correlation to the S&P 500 than has gold. 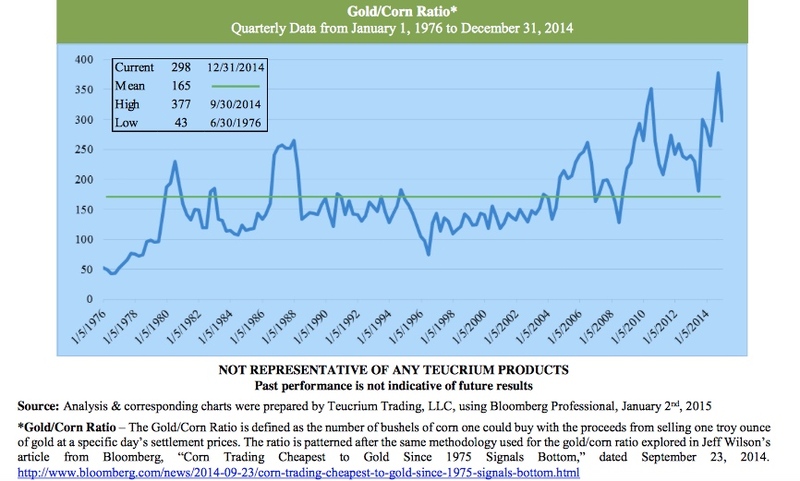 The ratio of gold to corn was in September 2014 at its highest level since gold started trading freely 38 years ago. It stands today at nearly twice its long-term average. Gilbertie says that, on average since 1976, an ounce of gold has purchased 165 bushels of corn. Last September, an ounce of gold could buy 377 bushels and today it can buy around 300 bushels, still nearly twice the long-term average. The ratios of gold to the other grain commodities and to sugar tell a similar story. Thank you for reading. My conversation with Gilbertie includes more original insights about the mechanics of trading futures and ETFs and about the supply and demand prospects for agricultural commodities. Disclosure: The author has no contractual agreement with Teucrium and receives no compensation from Teucrium. As of the date of this posting and for at least the following 72 hours, the author has no investments in the Teucrium Funds. Disclaimer: This article represents the author’s best faith efforts at presenting true facts. Nonetheless, despite the author’s best diligence, the article may include unintentional errors. Do your own work, read more research and draw your own conclusions before you decide to trade. Addis Ababa, November 21, 2012 –The African Union Commission (AUC), the Food and Agriculture Organization of the United Nations (FAO) and Instituto Lula of Brazil announced today they were joining efforts to help eradicate hunger and undernourishment in Africa. The decision was reached at a meeting between the Chairperson of the African Union Commission (AUC), Nkosazana Dlamini Zuma, FAO Director-General, José Graziano da Silva, and former Brazilian President Luiz Inácio Lula da Silva, Honorary President of the Institute bearing his name. This effort brings together the AUC’s leadership, FAO’s technical expertise and renewed commitment to fight hunger as well as the political backing of former Brazilian President Lula Da Silva. Knowledge and support from other international, regional and national partners will also go a long way to enhancing this new partnership. READ MORE. Failing harvests in the US, Ukraine and other countries this year have eroded reserves to their lowest level since 1974. The US, which has experienced record heatwaves and droughts in 2012, now holds in reserve a historically low 6.5% of the maize that it expects to consume in the next year, says the UN. READ MORE.